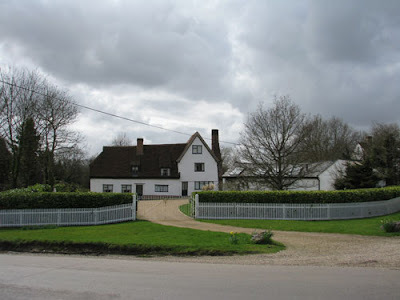 Yesterday I spent a delightful few hours at Hoglands - the former home of Henry Moore, probably the most celebrated UK sculptor of the twentieth century. I was at preview of a new exhibition there and also taking a look at what the Perry Green part of the Henry Moore Foundation has to offer people wanting to visit. I'll be reviewing the new exhibition Henry Moore Deluxe: Books, Prints & Portfolios early next week on Making A Mark. It's all about his graphical works and I have photos! The printmakers are going to love it. I'm also going to be doing a post about the sculpture and the sculpture garden on my Art of the Landscape Blog. Overall, I was very impressed with what I found and the grounds would make an excellent place to take an art group for sketching. In fact the only things that are missing a Studio/Education room for art classes and sketching stools for visitors - but you can't have everything and hopefully they will come in time. There's 70 acres of the house Henry Moore used to live in plus a very large sculpture garden, all his studios - for maquettes, drawing, printing and carving - an exhibition gallery and the large and ancient Aisled Barn which was moved here - and which you can see in my after lunch sketch. find out more about what it does here. The Centre is now open until 31st August. You need to book before visiting. It's also open on Easter Monday for the first time this year - between 11am and 4pm when there's an invitation to come and make some sheep artwork! Book for Easter Monday to take part in our fun activities. Enter our Sheepish Shapes drop-in craft activity, or do the Quiz Trail round the grounds and studios. On Tuesday, Wednesday and Thursday there are guided tours. Do not, whatever you do, drive there using the A414 near Harlow as they're doing major road works and the pace is slow, slow and yet more slow! I drove back to London via the Bishop's Stortford junction with the M11 - much easier! The Visitors Centre is opposite Hoglands and has a small car park, a very small refreshments facility and a shop. Don't think National Trust facilities - everything is on a much smaller scale. Apparently, there is also more parking available at the local pub The Hoops Inn which is currently being renovated. I couldn't find this and Google Maps says it's located in the middle of a field so maybe they'll attend to this once the renovations is finished? I'm not the biggest fan of watercolour pencils - but I have different collections of them and periodically take them out to try again - sometimes with a different make of paper - to see if I can find a combination which makes me want to use them more for sketching. 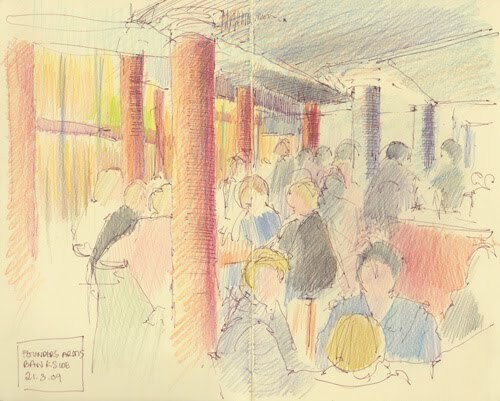 Last Sunday I went sketching with the Friends of the RWS Group down at the Bankside Gallery. 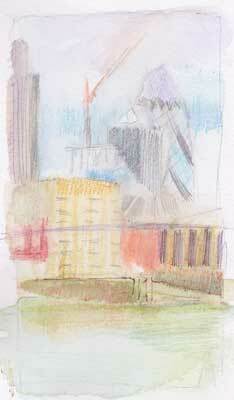 I took a Tate Landscape format sketchbook with me - which contains NOT paper by Seawhite. 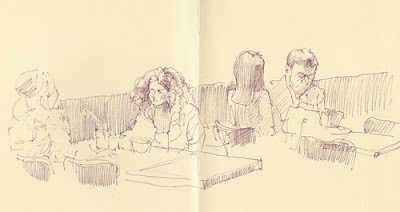 I then did all my sketching sat outside or inside the Founders Arms on the Bankside. For this one I sat next to the river and looked back at Tate Modern (behind the trees) and used the watercolour pencils. The next one is done sitting in exactly the same place and looking across the river. The first thing to say is that the neolcolours release colour faster and more smoothly than the pencils when water is applied. Scribble to wash in microseconds. I shall definitely be taking these out again. The main problems where in getting values sorted. I need to get a bit more organised about deciding whether I'm doing pen first or second. I think first because the pen nib doesn't seem to like damp paper which means waiting a long time for the paper to dry before I can apply pen. 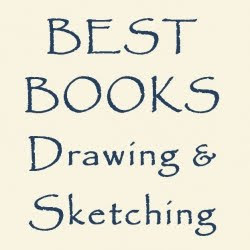 On the other hand my preference would be to top up and do more pen work after using the crayons with water. Maybe it'll work better when it warms up a bit. I've never found paper dries quickly when sat next to water on a cool day. 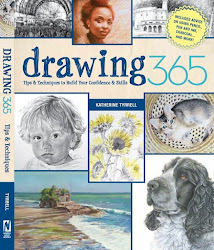 thinking about it that might have been one of the reasons I gave up on watercolour - too flippin' slow! Lastly, we had lunch in the Founders Arms. I can highly recommend the food at the Founders Arms (this is the Winter menu (pdf file) which is worth downloading if only to see the view of what you can see from the Founders Arms! My small plate of charcuterie was very nice and other meals I saw looked scrummy! The last sketch was done over lunch - very typical of me! I'm looking across the pub towards Tate Modern. I should also mention that the pub has a good selection of art on its walls - I saw quite a few prints by members of the Royal Society of Painter Printmakers! Incidentally yopu can't reach the Bankside Gallery and the Founders Arms directly from Blackfriars Bridge at the moment due to the construction works. The Thameside Path (click link for map of diversion) has a diversion in operation. A 100-metre section of the Thames Path between the south-eastern end of Blackfriars Bridge and the Founders Arms will close during the week beginning 14 September (just after The Mayor's Thames Festival) until late 2011. Pedestrians out for a stroll along the river will be diverted via Blackfriars Road, Southwark Street and Hopton Street. Later this month, my drawing group is having an exhibition at the Brokers Wine Bar in Leadenhall Market. I decided that I'd like to display sketches and drawings of either the market or the wine bar or maybe both. I need to get on with these so yesterday took myself off to the Brokers Wine Bar on my way home from other activities in the City of London. 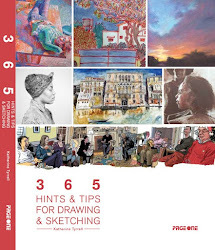 I've already completed one sketch (see Leadenhall Market on a very dull and rainy day) but I find drawings come more easily if I've had a qood walk around a place and familiarised myself with it. Yesterday it was dry and a lot brighter than my last visit so I had a long walk around Leadenhall Market and photographed it from every angle so I can work out which views are going to work best in what format before I go back and draw. I discovered that early evening is also a really good time to draw as the rather marvellous market lights were on making for a very attractive scene. Plus I like the contrast between the size of the structure and the size of the people having a drink outside the various hostelries in the market. I think maybe the smoking ban inside bars and pubs has made this a more popular place given you can be outside and under cover at the same time! I'm guessing that a number of the people who were around and about probably work at Lloyds of London as this is immediately adjacent to the market. 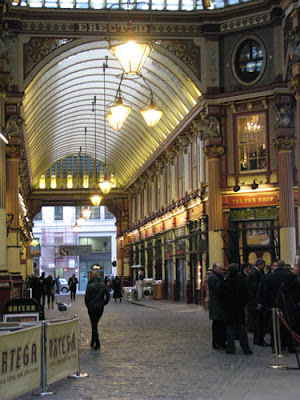 It's interesting that both Leadenhall Market and the world's leading insurance market stand in a place which used to be the forum and basilica some 1,900 years ago in Roman Londonium. The people at the Brokers Wine Bar were very helpful and friendly when I said I wanted to sketch - many thanks to Kevin and Veronica. 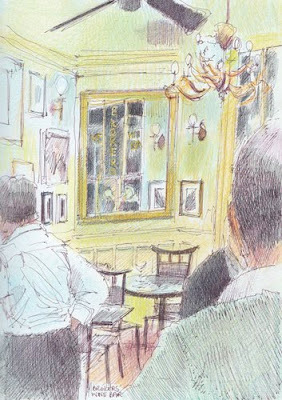 This is my first attempt at a sketch of this very long narrow bar which has windows looking down on the market on its long wall and pictures all over its walls. I'm planning to go back to have lunch and sketch some more. Thanks to all the people in the bar who I met yesterday and who made me feel very welcome. What's the colour code for a Moleskine sketchbook? 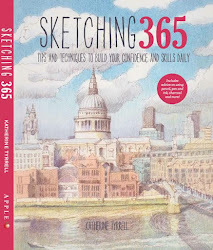 Travels with a Sketchbook in...... has had a major makeover following introduction of The Blogger Template Designer. It now has a pages bar at the top and a whole new colour scheme. It took ever such a long time tweaking the colours to get what I wanted. In the end I decided to go with the colour of the paper in the Moleskine sketchbooks combined with the colour of my kitchen cupboards - because I like duck egg blue! 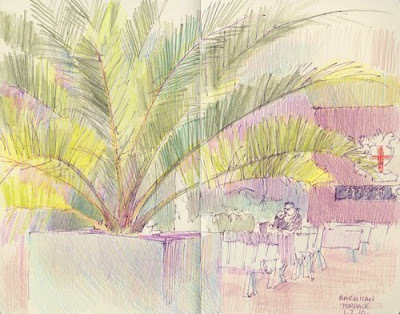 The sketch was done on my way back from the Musée Marmottan‎ during my last meal in Paris on the terrasse en plein air at the Restaurant la Gare in October last year (the link is to Streetview). It has a very musical website! I must get back to finishing the story of that French trip - see Paris, Normandy and the Loire (September/October 2009). I've not done the Chateaux of the Cher et Loire yet! This is a sketch I did back at the beginning of February which I forgot to post. 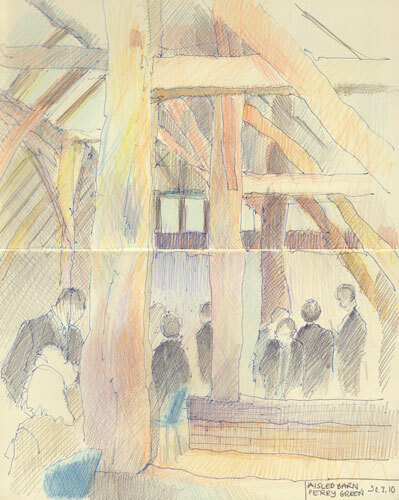 I sat out on the terrace having a sandwich after delivering my drawings for the exhibition last month. I think it was the first relatively mild day after the January icebox. I remember drawing it because I was intrigued by the palms against the City of London shield logo! It's now also turned into my first experiment at using Photoshop Elements on my new imac. I thought that when I'm changing so much it would be nice to stay with something that I know - but Elements has changed too between 7 and 8 - and of course this is the Mac version! But I'm getting there. This was scanned using my printer which the imac seemed to recognise straight away. However not from within Elements - still got to work that one out.